272 pages | 22 B/W Illus. Why do some modern societies punish their offenders differently to others? Why are some more punitive and others more tolerant in their approach to offending and how can these differences be explained? Based on extensive historical analysis and fieldwork in the penal systems of England, Australia and New Zealand on the one hand and Finland, Norway and Sweden on the other, this book seeks to answer these questions. The book argues that the penal differences that currently exist between these two clusters of societies emanate from their early nineteenth-century social arrangements, when the Anglophone societies were dominated by exclusionary value systems that contrasted with the more inclusionary values of the Nordic countries. 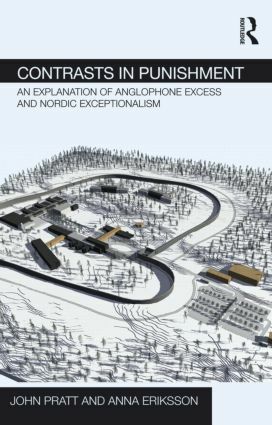 The development of their penal programmes over this two hundred year period, including the much earlier demise of the death penalty in the Nordic countries and significant differences between the respective prison rates and prison conditions of the two clusters, reflects the continuing influence of these values. Indeed, in the early 21st century these differences have become even more pronounced. John Pratt and Anna Eriksson offer a unique contribution to this topic of growing importance: comparative research in the history and sociology of punishment. This book will be of interest to those studying criminology, sociology, punishment, prison and penal policy, as well as professionals working in prisons or in the area of penal policy across the six societies that feature in the book. "Contrasts in Punishment will take a central place in the emerging literature seeking to explain persisting differences in levels and forms of punishment in modern societies. Its ambitious comparative and historical perspective, and in particular its interpretation of how institutional features of these societies develop over a long span of time, and of how criminal justice and other institutional arrangements interact to produce distinctive dynamics and outcomes, produce significant insights which will surely shape and stimulate debate in this important field." Nicola Lacey, Senior Research Fellow, All Souls College and Professor of Criminal Law and Legal Theory, University of Oxford, UK. "These are people, with values and policies that are both different to much current penal thinking and which subsist in contemporary consciousness, who are not Scandinavians, but who are part of our traditions, our heritage, our culture. One response to this book that we might make then, is to attempt to rediscover these latent influences, identify the points of continuity and the values sustaining them, and attempt to articulate them in contemporary debate, bring them more squarely back into play in the penal field. I think this book has assisted that possibility and I congratulate the authors on a rich and wondrous piece of work, an enthralling and instructive read and a very significant contribution to international comparative penology and penal politics." Emeritus Professor David Brown, University of New South Wales, Australia. (The) "book gives clear cause to challenge the seemingly inexorable rush among most Anglo societies to emulate the essential brutality and absurdity of the US system. Readers are reminded that lagom (lack of both overcondemnation and praise) is a wise principle for policy makers to adopt, though there are many structural reasons why so often they do not." "As academics and practitioners become increasingly frustrated at the punitive criminal justice policy and the condemnatory public discourse around offending in the UK, they are inclined to look to the Scandinavian nations as examples of an alternative approach. Pratt and Eriksson’s excellent book provides a detailed account of these differences in approach to criminal justice, locating penal policy in a social and historical context." "Recent comparative penological interest in the explanation and meaning of punitiveness was kick-started by Garland’s Anglo-American-centric The Culture of Control… Pratt and Eriksson’s study is a considerable and essential addition to this literature." Introduction 1. Investigating end explaining differences in punishment 2. The production of cultural differences 3. Two welfare states 4. The introduction of modern penal arrangements 5. Two welfare sanctions 6. Punishment in the age of anxiety. John Pratt is Professor of Criminology at Victoria University of Wellington, New Zealand. From 2009-2012 he was also a Royal Society of New Zealand James Cook Research Fellow in Social Science and Fellow of the Straus Institute for Advanced Studies of Law and Justice at New York University 2010-11. He has published extensively in the areas of the history and sociology of punishment and comparative penology. In 2009 he was awarded the prestigious Radzinowicz Prize by the Editorial Board of the British Journal of Criminology. Anna Eriksson is a Senior Lecturer in Criminology at Monash University, Melbourne, Australia. In 2009 she was awarded the New Scholar Prize by the Australian and New Zealand Society of Criminology for best publication, and in 2012 one of only two Australian Research Councils Awards for early career researchers in criminology, funding a three-year study on comparative punishment between Australia and Sweden.